We’re an old and new school, no nonsense coffee roaster that understands people like to drink their coffee many different ways. 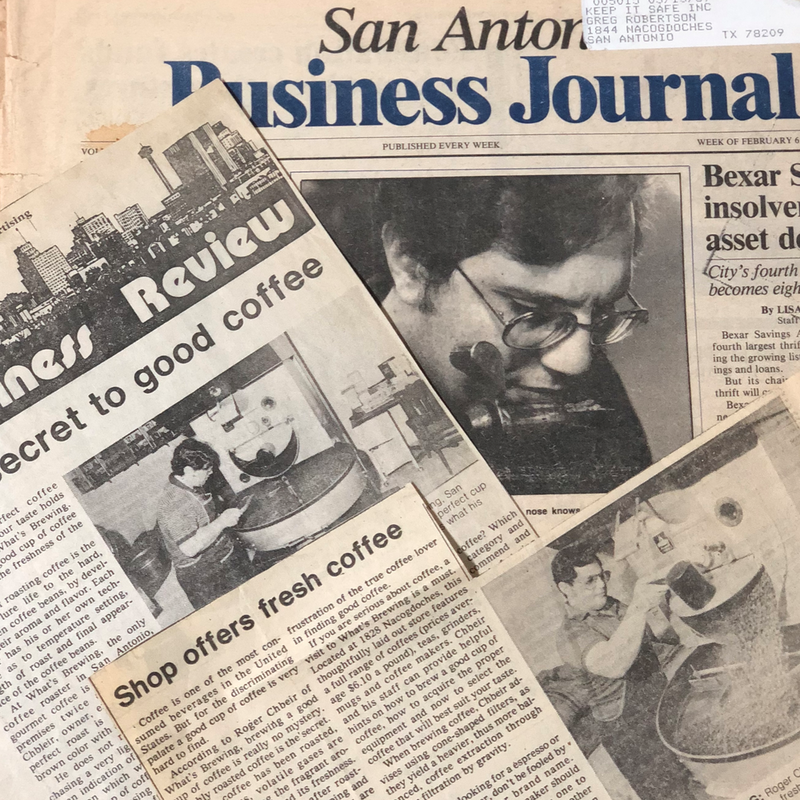 Roger Chbeir started the business by asking the question, “what kind of coffee do people like to drink?” Our business continues to be shaped by the answer to that question. For nearly 40 years we have been offering a variety of coffees ranging from light roasted single origins to thoughtfully crafted and darkly roasted blends. The business continues to operate as Roger’s two sons Sami and Tony maintain the tradition of freshly roasting and careful curation of green beans to ensure ours and our customers’ standards are met. Our coffees are always specialty graded, freshly roasted, and delicious! Our goal is to help you make the coffee that you like to drink, at home. We thank our customers for their loyalty and look forward to many more years of sharing and drinking delicious coffees with you. Cheers! The youngest of three kids growing up in San Antonio, Sami watched as his father worked hard to bring specialty coffee to South Texas. He began roasting beside his brother and father in 1997. Sami, and the rest of the Chbeir kids, graduated from Churchill High School, where he met his wife Natalie. They have three kids whom they love to travel with. He’s a fair mountain biker, a lousy dancer and a lover of audio books. Roger is the reason we’re all here. He’s a living legend whose story cannot justifiably be fit on an internet webpage. You’ll have to visit our store in hopes of catching him and hearing the stories firsthand. While you’re here, you can take home some of the blend that carries his namesake, Roger’s Blend, originally blended by Roger himself. For a long time, Tony held the title of highest volume coffee roaster in San Antonio, seconded only by his brother Sami. These days, Tony handles service and delivery to wholesale clients, fathers two beautiful children, and upkeeps the tradition of authentic business relationships. Find him at every restaurant in town, at the star-parties he hosts at the warehouse, and carefully tending to the coffee plants at Finca La What’s Brewing? Christopher is the funkiest motha on the floor. He’ll answer your phone calls, design a bar, and pull an espresso all at the same time. One day, he’ll conquer the world, but for now, he’s installing, training, and keeping the flow a flowin. A new recruit to the third wave coffee world, but not without experience. Hailing from Uganda, Koko boasts a hoard of knowledge, a nice set gloves, and a rad, red, CR-V.
Jake, or ``dude`` as he's better known, is an ex-barista, sculptor, and owner of a couch.If he’s not browsing Reddit or watching hockey videos, he's roasting your favorite blends and creating the best cold brew in San Antonio. Ever seen Mean Girls? Lexi fuses unbridled enthusiasm with classic Queen Bee attitude for an electric customer service experience. Stop by, grab a drink, and hear that infamous “have a good day” on your way out. Brendon is the ultimate assistant. He's first one down to the Pearl, he's second to Christopher at Smash Bros, and the third best at pinball in the warehouse. He says he’s working on a Psychology degree, yet he’s always here. Is your coffee delivered in a box? Chances are this man made if for you. Every pound, every bean is carefully shipped by this man right here. Anthony loves to cook, the outdoors, and going to his ranch.